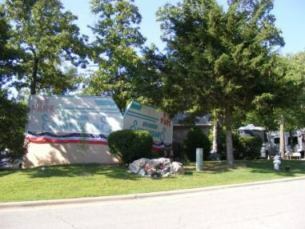 The Branson-RVParks-76WestArea are great locations for the RV'er if Branson entertainment is your main focus. Many of the Theaters and attractions are within walking distance of the various campgrounds. Shuttles and taxis are also available to get you to all areas of Branson. Prices are reasonable and they sure will take the hassle out of driving. If driving is your desire, the Branson-RVParks-76WestArea has good access to alternative routes to all areas of Branson. All locations except ABC Campground are in the 76 West-Light yellow on our area map. ABC Campground is just out of the area on Hwy 248 in the Branson North-Pale blue on our area map. The 76 West area include parks along or just off of the 76 strip from Gretna Rd/Hwy 165 (by Titanic) to Shepherd of the Hills Expressway (by IHOP) as well as those on Shepherd of the Hills Expressway. Directions given by park are based on the starting point at the Junction of Hwy 76/ Shepherd of The Hills Expressway/ Hwy 376. This intersection includes RFD Theater, Comfort Inn, IHOP and a Conoco C-Store at the 4 corners. Prices are given as guidelines where possible. Please check with RV Park for current pricing. Curved roads are common here so an East/West, North/South designation indicates the general direction of the road. Branson-RVParks-76WestArea are in the 76 West-Light yellow on our area map . 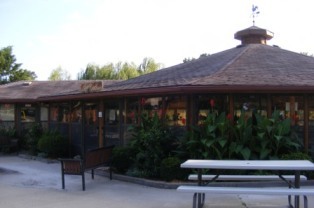 Shenanigan's is a shaded and quiet campsite that is within walking distance of the famous Hwy 76 Strip. Touted as a immaculately clean campground, this should provide a great home for your Branson vacation and is one of the favorite Branson RV Parks. Directions from Jct. 76/SOTH Expwy/376:South of intersection past IHOP to 1st Road (Green Mtn Dr.). Turn left & follow ½ mile to stop sign in front of fire Station. Turn right on Keeter St., Shenanigans is on your right. Weekly rates: Pay for 6 nights and get the 7th night free! Branson-RVParks-76WestArea are in the 76 West-Light yellow on our area map. Located within 200 ft of the famous 76 country strip behind Ruby Tuesday's and Ripley's Believe It or Not, Pea Patch is close to theaters, restaurants and lots of fun parks and Mini-golf and makes camping in Branson a convenient and fun vacation. Directions from Jct. 76/SOTH Expwy/376:East on Hwy 76 for 1 mile to Harvey Road (between Ruby Tuesday and Ripley's Believe It or Not). Turn right on Harvey to Pea Patch RV Park. 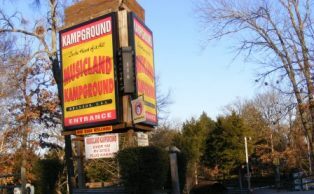 You can't get much closer to the entertainment on the strip than Musicland Campground. Located on Gretna Road just north of Hwy 76 and behind the Titanic, this campground is nestled among trees and feels as though your in a wilderness setting. Although situated on the western edge of our area maps 76 Central location we have included this as part of the Branson-RVParks-76WestArea which is Light yellow on our area map. 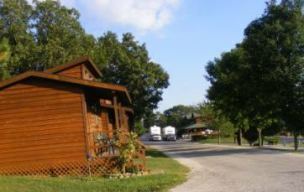 The campground offers good access to alternate routes so getting around Branson is easy. Although situated in the Branson North part of our area map we have included this as part of the Branson-Campgrounds-76WestArea which is Light yellow on our area map. ABC will be just north of this area on Hwy 248 in the pale blue area. America's Best Campground is located on Hwy 248 between the Ozark Mountain Highroad (Hwy 465) and Shepherd of the Hills Expressway. Easy access to and from Hwy 65 via Branson Hills Parkway, the Highroad or Hwy 248. ABC is secluded yet minutes from Branson Hills Parkway shopping, downtown, and the theater district on Shepherd of the Hills Expressway and Hwy 76 Strip. "Rhinestone Cowboy" Deluxe Cabin- sleeps 2 plus loft, bathroom & loft. The" Braschler Family" Cabin-sleeps 6 with full kitchen, bathroom, 2 bedrooms & hide-a-bed. "Camper Cabins" have Dbl bed & set of bunk beds, heat/air & TV-no plumbing or linens. The bath house is located across the street. Bring your own linens. Picnic table, water spigot & grill are included. The Branson-RVParks-76WestArea is surrounded by a number of fun parks and activities including White Water, Imax Theater and several Mini-Golf Courses. The area allows for easy access to Silver Dollar City, Shepherd of the Hills Outdoor Theater and Table Rock Lake.